BBC Radio Bristol Christmas Concert. Who ARE Black Sheep Harmony Ladies Chorus? Black Sheep Harmony are a dynamic female A Cappella Vocal Group based in Bristol, UK. They sing music from many eras from Swing, Popular, Show, modern and Christmas music. We are open to singers age 18 plus with no upper age limit. You must be able to sing in tune. Take a look at our website to find out what we are all about. All our rehearsals are always open to the public who wish to visit us and to potential new members, so why not pay us a visit. We have a break with homemade cake and tea which I can guarantee is totally delicious thanks to our talented bakers. 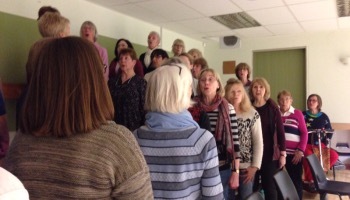 We rehearse every Thursday evening at 7.30pm-10pm, at Cadbury Heath Hall, School Road, Cadbury Heath, Bristol, BS30 8EN. Want Black Sheep Harmony Ladies Chorus to sing at your next function? 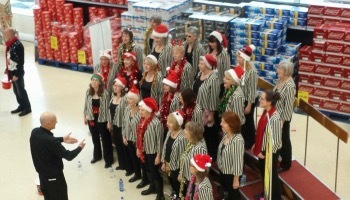 Why not hire Black Sheep Harmony Ladies Chorus to entertain at your next event? We can perform at corporate functions, charity events, community Entertainment events, birthday parties, christmas parties, awards nights, weddings, engagements, anniversaries, engagements, and even funerals and memorial services.